As pointed out in an earlier post, HTML5 and the webfont CSS @fontface property will phase out the need for font replacement techniques like sIFR or Cufon. 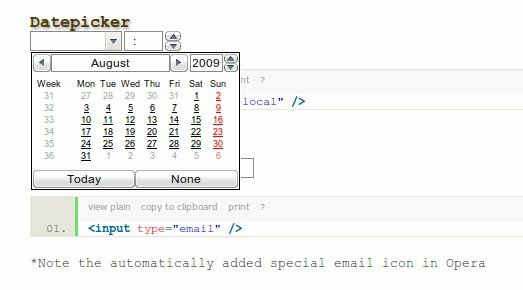 HTML5 that now incorporates the Webform2 specification which has internal support for a calendar tool, range slider and number spinners. Opera is the only browser that has support for Webform now for several years. I made some internal tools that used it. It so simpel and powerful. And no more localisation issues. With other HTML5 nonsupporting browsers it will degrade to an ordinary input field. Default range: 0 – 100. I guess this will be another UI favourite. Webfonts is a technique for defining a variety of fonts to be displayed in a web browser. In CSS authors typically specify font characteristics via a font property (font-family). In CSS1, all fonts were assumed to be present on the client system and were identified solely by name. 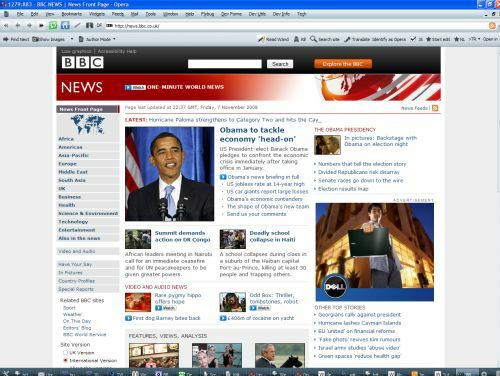 Designers of webpages had no way to propose other fonts to the user other than generic default fonts installed on the client computer. Now with CSS3 the situation, when there is no matching font on the client, has been expanded. Fonts can be downloaded over the web by the browser and used on the client. This gives the author much more control over the typography and design of the page, because it’s not longer dependend of locally stored fonts. This means this is no need anymore for flash based work-arounds like sIFR. The other good thing is that browsers can fall back to more generic fonts, when they don’t support the webfonts. So there is no reason at all to wait using them. Like for most web-innovations based on open standards, Microsoft is NOT supporting it. They have there own implementation based on a proprietary standard EOT. This is not a W3C recommendation nor is it supported by any other company. I think we have to wait till Internet Explorers` marketshare is dropping under 30% before Microsoft is starting to support open standards Web Fonts. To see this paragraph in a different font, try the appropriate buttons. You need a webfont supporting browser: Safari 3.1+, Opera 10 +, Firefox 3.1 + or Chrome 2 +. The canvas element let you do some marvelous tricks with images. Imagine the canvas as an IMG element extended with the ability to set/change every pixel of it. In this demo an image is loaded in an IMG element, this image is copied in the canvas element and rotated 360 degrees. You can see the original image just below the canvas element. Refresh page to restart drawing! Interestingly, you see quite different rendering qualities in the browsers. MS Explorer doesn’t show anything. Google Chrome surprisingly shows the worst quality, it’s output is jagged and doesn’t seemed to be aliased. Opera is best, followed by Firefox and Safari. I did expect to see speed differences, no render differences. If you don’t want to test in all browsers, or you don’t have them installed, you can see the results here.